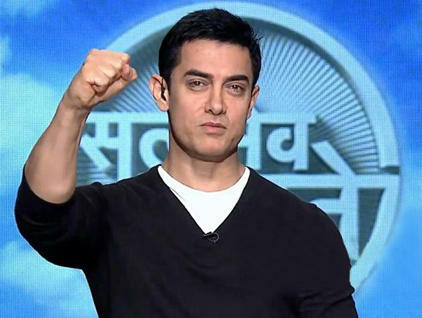 Satyamev Jayate the immensely talked about TV show has entered into its sixth week what with the sixth episode being telecast today. Having one of India's biggest film celebrities hosting the show has given the show the kickstart that it needed and it has helped that the content was well researched and hard hitting. It has set tongues talking and every episode is discussed in detail over tea conversations and parties. However, from a TRP point of view is the show a hit or not? Read on to know further! The first episode which featured the topic of female infanticide had a TRP of 4.27. It was said in the media that the show had reached out to 2.67 crore people which is a record breaking number by any TV show. The second episode got a rating of 2.9 and the third the episode which was aired on May 20th, the show has had a rating of 2.95. The show is thus managing an average of about 3 TVR per episode. We feel that now that six episodes are over, Aamir needs to do a bit of reworking on the show. It's getting a bit too predictable. Viewer interest needs to be maintained and sustained and this can happen only when something new happens. We look forward to the remaining episodes of the show. Bharati is a new add to the "The Kapil Sharma Show".